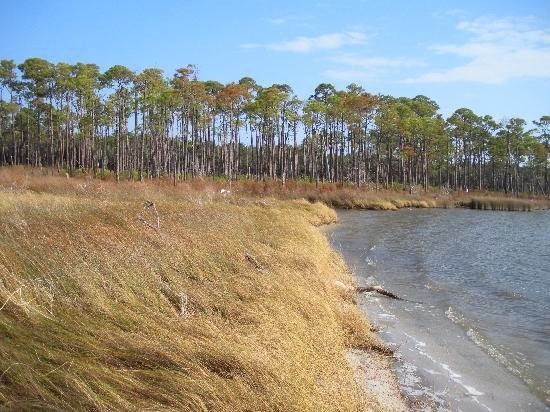 Bon Secour National Wildlife Refuge in Gulf Shores on the Alabama Gulf Coast is approximately 7,000 acres of coastal lands, ranging from constantly changing natural beach dunes to rolling pine-oak woodlands. Management at Bon Secour is aimed at protecting and preserving these unique habitats and associated wildlife for generations to come. The refuge protects the well-being of native plants and animals, serves as a living laboratory for students and scientists, and provides wildlife-oriented public recreation. Established in 1980, Bon Secour (the name, in French, means "safe harbor") is smaller than most other national wildlife refuges, and is divided into Sand Bayou, Perdue, Little Point Clear, Fort Morgan, and Little Dauphin Island. Located 50 miles due west of Pensacola, Florida, and 50 miles southeast of Mobile Alabama. Bon Secour National Wildlife Refuge is one of 540 refuges in the National Wildlife Refuge System administered by the U.S. Fish and Wildlife Service. The Refuge is open during daylight hours only.